Less than 30 days: cancellations made less than 30 days prior to check in will forfeit all deposits and rental balance due payments. All stays have a check-out cleaning fee of $135. Stays of more than 12 days have additional mandatory interim cleaning fees of $135. For example, if you reserved the condo for 28 days, there would be two interim cleanings during your stay. One on the 12th day and one on the 24th day, as well as the check-out cleaning upon departure. Potential extra fee: There is a $40/hour charge for excessive cleaning beyond the standard check-out cleaning. Check-in time is 3 p.m. or after: no early exceptions. As we often have guests departing the day you arrive, we cannot allow early check-in or storage of luggage in the room before 3pm on the day of arrival. Consider booking previous night if you have an early flight arrival. As we often have guests arriving the day you checkout and only in-room luggage storage, we cannot allow late checkout. Consider renting an extra night if you have a late flight out. Please report missing, broken, or damaged items immediately to local contact Ryan (808-589-7126) local call from your room). No pets of any kind are allowed in the condo or on the lanai. A charge may result for damage to the condo or contents, missing contents, excessive cleaning required after checkout or for exceeding the maximum number of overnight guests. WPH Pacific LLC, is the sole owner of the information collected on this site. We will not sell, share, or rent this information to others in ways different from what is disclosed in this statement. WPH Pacific LLC, collects information from our users at several different points on our website. This web site contains links to other sites. Please be aware that we, WPH Pacific LLC, are not responsible for the privacy practices of such other sites. We encourage our users to be aware when they leave our site and to read the privacy statements of each and every web site that collects personally identifiable information. This privacy statement applies solely to information collected by this Web site. Have recently stayed in apartment for six weeks. Very good facilities for cooking etc. Most of the time we ate in and had sufficient equipment etc. to cook full meals. Very handy for the beach with towels and chairs provided. Comfortable bed and clean linen altogether very good accommodation. Great value for a superb oceanfront view condo in Waikiki. Close to beaches, Hilton Lagoon, surfing, restaurants and a short walk to Ala Moana Shopping Center. A very comfortable & spacious holiday apartment. This self contained holiday apartment is on the 12th floor of the Ilikai Marina, facing the ocean & marina itself, it is an older style building, but extremely comfortable with all the facilities you would need for that perfect holiday, & fairly centrally located.The kitchen is well equipped, with a huge refrigerator, has a spacious lounge & bedroom (very comfortable California king size bed), and even a "Romeo & Juliet" balcony to enjoy a cocktail or 2 whilst you're watching the sunset, or just relaxing & gazing at the yacht's below.Recommended. We will return. My husband and I had a wonderful time visiting Waikiki. The comfort, view, accommodations and location of the condo exceeded my expectations. The king size bed was very comfortable. The shower head had plenty of water. After a day out in the sun, coming back to a very adequate air conditioner was very nice!! The condo is close to everything! It was very quiet. If and when we return to Oahu we would definitely look to stay here again! Great place, great view, great location - specially if you are heading to the convention center or the GIGANTIC nearby mall which are both around 0.5 miles away, give or take. Ilikai Marina 1286 was very convenient for me because I had several conference-related meetings at the sprawling, right-next-door Hilton Hawaiian Village. There's a short walk to a nice beach but a it's bit of a walk to the Waikiki "strip"... it's a nice walk, however. Specifics regarding the unit itself? Comfortable bed, good temperature control and great marina view (as pictured). The shower drain is a bit slow (but pressure is good and water is hot) and I had trouble with the cable (but I'm not there to watch TV). Also, parking was $23 per day, which seemed high (not the host's fault as this is building policy - also, there's far too much auto traffic in the area to rely on a car to get around anyway). Overall, I recommend this place highly as it's nicer and less expensive than most decent hotels nearby. Great location, great view but tired kitchen. Just spent a week in Honolulu and the location of this condo is fantastic. Beautiful views across the Marina and only a short walk (about 20minutes) to Waikiki Beach. The condo is reasonably well equipped but the kitchen is definitely in need of a Reno. The cupboards are a bit tired and showing their age. Unimpeded view of the ocean and harbor. Makes you forget one is in a large city. The condo is appointed simply, but clean and well laid out. Kitchen has all the conviences of home; microwave/stove and dishwasher, coffeemaker and kitchen assundries. Laundry is on the 8th plenty of machines (get a roll of quarters at the abc store). Rental car is a luxury we did without. Rental cost plus $20 parking. The bus system is adequate and the drivers are 1st rate in assisting travelers. Aka Mona park/beach and shopping center just short bus ride. Plenty of tennis at the park. Locals welcome travelers to join in. Just ask. For walkers and joggers very nice area. Uber is alternative and about 20% cheaper than taxi. It was our second stay at Ilikai Marina Condos, but the first time in Condo #1286. What a wonderful place. The condo was spotless clean, well-equiped (kitchen, bathroom, beach tools etc.) and in very good condition.Most impressiv was again the location with the breath-taking view from the living room and the lanai and close to the beach and Waikiki.Gillian & Vlad (the owners) were very friendly and helpful. Thank you so much!We had a wonderful time and will hopefully return pretty soon. Great 180 degree view of ocean & sunsets & Hilton fireworks.Comfortable bed. Great location.Only negative is bathtub drained very, very slowly. Needs drano. Hi,We greatly enjoyed our one week stay in Condo 1286.Clean, well furnished and stocked with extras (ie beach chairs, beach towels). Excellent location (next to the Hilton, several restaurants, shopping Mall, 5 minute walk to major waikiki beach strip etc) and view- overlooking the marina.We have been to Waikiki several times (6) and this is definitely the BEST value for your money. Excellent internet. Comfy bed. Great quiet AC. WE WILL BE BACK!! This is our second stay in the Ilikai Marina condos. We love the view overlooking the harbor and beautiful sunsets. It is a short walk to the Ala Moana beach park and shopping mall and is located on the west end of Waikiki. Great location to view the July 4th spectacular fireworks.The condo is clean and comfortable but a bit dated. The coffee maker does not work well and probably needs to be replaced. Appreciate the combination lock entry, laundry facilities on the 8th floor and available parking (even though it is paid parking & pay attention to the instructions about paying for parking).Booking the reservation went smoothly with good communication. Good accomodations for the cost. I found this condo on Vacation Rental by Owner and am so glad I did. We have stayed in hotels on our previous visits to Oahu but will always go this route in the future. The condo was clean and provided extra room for us. My husband and I have different bed times and this set up provided space for me to read or have my early morning coffee without disturbing him. We were able to watch the Friday fireworks right from the balcony which was awesome. The beautiful view every morning overlooking the harbor and ocean was breathtaking as well as the sunsets. It was in a convenient location to the Ala Moana mall and bus line. The ABC store nearby was great for sandwich fixings and other provisions so we were able to eat in. I appreciated the laundry in the building which saved on packing as well. There were also beach chairs, towels and a cooler to use. Thank you for making this available to us. I truly appreciate it. We LOVED it. We enjoyed our stay at the llikai Marina Condo. The view and location were great. The size of the condo was perfect for my husband and I and was nice having a kitchen so we didn't have to eat out as often. Although we did not get to see the Friday night fireworks put on by the Hawaiian Hilton because we decided to see a show I heard they were very nice. The only downfall with our stay was when we arrived the toilet was making a high pitch noise which was very annoying. My husband played with the handle and tank and it would stop or if you flushed the toilet it would stop but would come back around 3 to 4 hours later. I called Ryan as instructed if we had any issues and spoke with Ryan who suggested trying a few things which we did but didn't work. Ryan was to call back the next day when he was in the area but never did so we put up with this annoying sound. The worst was in the middle of the night it would wake you up so you had to get up and flush the toilet and you were good for another few hours. We stayed 4 nights so by the 4th night we were ready to go. When I spoke with Ryan upon checkout he apologized for not stopping by because he was busy. I thought the condo was nicely furnished, other than the toilet issues we had a pleasant stay. This was our first time booking through VRBO so not sure if we would book again. I would of rated 4 stars if not for the toilet issue. We are glad you enjoyed our condo for the view, furnishings, location, size and convenience of the kitchen. We are sorry for the aggravation caused by the high pitched noise from the toilet. A plumber has now fixed the problem. We have wonderful staff and I am sorry there was some miscommunication between you and Ryan. He assumed when he didn't hear from you the following day, that you having following his suggestion of an adjustment of the handle and water pressure had solved the problem. I believe this to be a miscommunication. We are extremely responsive to guest questions and concerns. Many times an adjustment of the handle and water pressure will remedy the high pitch. He was going to adjust and call us if the sound persisted. We did not hear back, so blindly assumed it had stopped. Regretfully I did not follow up. I spend ~10 days with my wife and toddler in this location and it was quite pleasant. We wanted to be able to eat at home and did not have any issues storing or preparing food in the fully-equipped kitchen. The location has a lot to offer, including a short walk to the Hilton Hawaiian Village lagoon without needing to walk on streets (cut across to the Modern on the second floor bridge). The room isn't fancy, but still quite good. We thoroughly enjoyed this clean, well laid out, and spacious condo. Located on the water side (makai) of the building, it was quiet and protected from busy Ala Moana Boulevard and had a lovely view of the marina and sunsets. The kitchen was clean and well-equipped (although the cupboards and counters were in need of an update) and we appreciated the beach chairs, accessories, and towels that were there for guests to use. The bathroom was clean and the plumbing worked fine but, on occasion, made an odd whistling sound. An empty flush seemed to cure it :-) . The air conditioning worked well but it took some time to figure out how to adjust it. Simple instructions would have been most appreciated. A remote for one of the TVs was not working (battery) and a ceiling light was burnt out but we assume these have been looked after. There was a bit of excitement on our first night when a neighboring apartment's smoke alarm went off 2 or 3 times in the evening... a bit annoying but not serious and it was fine for the rest of our time there. Overall, we would highly recommend it and would go back in a heartbeat! Great spot overlooking the marina. Close to Ala Moana Shopping Centre. Lovely appointed villa. Quite spacious for a 1 bed villa. Good views of fireworks if you are there on a Friday night. just as it looks in the photos great position no problems at all thanks for a great stay. This is the 2nd time we have stayed at this condo and again were extremely happy with the convenience and location. This place is perfect for our family to stay. We have to come back at the end of the month and are hoping to stay here a 3rd time. let the numbers 1286 forever be etched in your mind when you think vacation and you think Hawaii... This little gem is the cream of the crop. Perched above the Ilikai Marina it sits like the crows nest, watching over all that you came to experience. Throw in terrific management and owner cooperation and you have a vacation to remember! Ilikai Condo 1286 is a nice little condo. It faces the marina and has a tiny balcony with sliding glass doors. Nice and comfortable king bed. The bottom sheet originally on the bed was too small due to the deep mattress but there was another in the closet that fit much better. We enjoyed the extra "stuff" we found in another closet too. Beach toys and chairs and a small cooler. It is located very close to the hustle & bustle of Waikiki Beach without being in the middle of the noise. Very quiet. We walked a lot but we could rent a car nearby. Public transportation was right across the street. There is a new mall nearby, within walking distance for us. The beaches are amazing! Mahalo! We loved your space! We really loved that we did not need a key! Nice clean place! The condo is nicely furnished, with full kitchen, many appliances. The view is outstanding, and nicely placed for beach and shopping, and restaurants. For the price, view and convenience, it is the best deal in Waikiki. Not only that, the apartment manager, representing the owners, was exceptionally helpful in many ways, going the extra mile for me more than once. We are so glad that you enjoyed your stay at unit 1286 at the Ilikai Hotel. This unit is equipped well and is in a great location for everything. Thank you for mentioning that the management team was very helpful and did meet your needs. We hope you can come back again soon! Really enjoyed our stay in Hawaii and the Illikai Marina is our favorite property. This unit was very nice and clean. We like that it had dishwasher and disposal, most in this building don't. Hope to stay here again on our next trip.Mahalo! We appreciate you kind words in the review you posted. It is always nice to hear that the condo was perfect for you and that you want to come again. The location, the views and the accommodating unit makes for a great vacation. Thank you for your business! This condo was very convenient. We enjoyed our stay and the condo was awesome. We will be back. We stayed at the condo for 11 days in September, 2015. The condo is very nice and the location is wonderful. Our initial problem is that we were given the wrong code to open the door. However, we contacted Monika (the owner's local manager) and she provided the correct code. The condo is clean, however the kitchen is very, very old. The kitchen cabinets are likely the original cabinets form perhaps 40 years ago. However, they are clean, and the kitchen is 100% fully furnished. The TV in the living room was fine, however there was no reception for CNN and ESPN. I contacted Monika and she had a gentleman come out quickly. However he could not repair the problem & believed it was a cable issue. Unfortunately for me, these are the 2 channels I watch most frequently. Not the worst thing in the World but a bit disappointing. The bathroom was clean and everything worked very well. In addition, the laundry facilities on the 8th floor were very convenient. We bought detergent at the ABC store right across the street. We also found a relatively private beach at Ala Moana park, a 5 minute walk, and having the beach chairs and the "cart" to carry the towels and snacks was extremely convenient. The condo building does not have a pool, and we did not notice this when we made the reservation. Next time we go to Waikiki we'll stay at a condo with a pool. This is not the owner's fault of course, and one who does not need or want a pool (the beach is literally a 3 -5 minute walk) would surely want to stay at this condo; it was a very good experience. We are glad you enjoyed your stay and found the condo clean and a well equipped kitchen, even though you found the cabinets dated. I am sorry you were not able to get all the channels you wanted on tv. We always strongly encourage guests to bring their correspondence with the instructions and their personal code for condo entry. I apologize that over the phone I gave you the wrong code. I am so glad our local contact within a few minutes was able to give you the correct code as written on all your reservation correspondence. Next time you visit make sure you check on whether the building has a pool beforehand! Nice, clean condo with spectacular view. Nicely furnished, but kitchen needs help! As well traveled VRBO users we have seen a lot of spaces. This unit, needs to have been prepared much better in regards to the kitchen. Although the appliances were ok, the basics of having sharp knives, any sealable containers for left overs, aluminum foil, Saran wrap, cooking oil And a corkscrew were ALL absent! We were given a local phone number to call but muddled through as we like our privacy as well as it needed to be prepared prior to our stay. We used a blender jar for flowers! Excellent accommodation in good location. Have recently stayed in apartment for six weeks. Very good facilities for cooking etc. Most of the time we ate in and had sufficient equipment etc. to cook full meals.Very handy for the beach with towels and chairs provided.Comfortable bed and clean linen altogether very good accommodation. Mahalo for your great review. It is great testimony considering the length of you stay of how well equipped this unit is. We are glad you found this unit to be a place you felt comfortable in for such a long stay. We hope you will come and stay with us again in your next trip to the islands. Mahalo for your business. This was a great value for us. The plusses are: good location, view of ocean/harbor,very comfortable bed, separate vanity area from bathroom. Unit is perfect for two. Master bedroom is only separated by sliding partition door, square footage feels smaller than stated, kitchen and bathroom were adequate but need updating, sofa bed was not very comfortable. Owner Gillian is very nice and responsive. We found the condo very clean. It was our 2nd stay to this particular condo and it was almost exactly the same than last year. We had an issue with the coffeemaker the first day and Valerie came very quickly with a new one. Very efficient.There is always an issue with the noise on the street in the middle of at the night, There's nothing we can do, it's the location but I thought readers would like to know. I also think that the beach towels could be renewed. Thank you for your reviews upon your departure at the condo at the Ilikai Marina, unit 1286. We are happy to hear that this was your return trip and you choose to once again stay with us and allowed us to accommodate you in your trip to Oahu. We are happy to hear that you found the unit clean and accommodating as we do strive to make your time with us a great one. The traffic noise of course is a given and price that comes with a big city stay and is frankly part of the mood and excitement of being where the action is. Thank you for your comment with the beach towel situation. We will certainly be making a purchase to replace those with new ones. We look forward to do business with you again and serving you in your next stay. We stayed at Gillian and Vlad's 1286 Ilikai Marina Condo for second part of our Honeymoon trip. The view from the condo was absolutely amazing. The unique harbour view in the front along with the picturesque left-side view of the beautiful Waikiki Beach-front and the Hilton Village was fabulous. I would strongly recommend this condo to couples who are looking for the most amazing view at the most affordable prices. A must stay !!!!!! Illikai Marina is situated in a very convenient location where it's literally close to everything from the supermarkets, Ala Moana, restaurants, ABC, as well as the beach! The one feature of this condo that stood out was really the view of the marina you get from the balcony. Eventhough you're in Honolulu, you won't really feel too much of the busy streets you'll find behind the building. If you wanted to cook a meal or two, there's enough amenities to do that including a rice cooker, pots/pans, steamer, blender as well as a coffee maker. Unfortunately, some people may have used the baking pans and not really bothered to wash them. The bed in the bedroom was extremely comfortable. The sofa in the living room folds out into a bed but the mattress sagged. Luckily we could use the sofa to sleep on without folding it out. Communicating with the owner (Gillian) was a real pleasure as she always responded kindly and promptly! We found we needed a pair of scissors and couldn't find any in the drawers and the following day, she had sent someone up to drop one off. We did use the parking downstairs and currently it costs $20 for in/out parking per day. Just make sure that you tell the person in the booth prior to getting in where you'll be staying and how long. They'll most likely be asking you to pay it all in advance when you first take your car out of the parking lot. My first impression upon entering the apartment was "wow". Ceramic tiled floors throughout, 100% cleaner than carpet. Gorgeous unobstructed view of marina, the ocean, Hilton Lagoon. Very convenient to watch Friday night Hilton fireworks directly from the balcony. Quality furniture with tropical flare. Comfortable sofa and king size comfortable bed. Appreciated dishwasher and the ample supply of dishes/pots/pans etc in kitchen. I cooked full meals every night with pleasure. The kitchen cabinets/counter, while in good working condition, could be updated to match the other rooms. Bathroom attractive, great water pressure, but no hand held shower wand, very important to females. Close to Hilton, enjoyed walking in Hilton Village. Slept with balcony door open all night, didn't need to turn on a.c., love to sleep with fresh ocean air and area is quiet at night, slept well. Would be perfect if somewhat closer to main action in Waikiki. It would be lovely to stay here again! Have just returned home after six weeks holiday in the apartment during January and February.We eat in the apartment most of the time and found that there was sufficient cooking utensils, crockery and equipment to enable us to cook what we wanted.Shopping was fairly close to hand at aBC and Foodpantry and we did a weekly shop at Foodland in the ala Moana complex. Walking there and taxi back.There was adequate beach equipment such as beach chairs etc. and the beach and lagoon were close to hand.Views from the apartment were outstanding and we enjoyed several firework displays from the lanai.There was occasional noise from the harbourside late at night but this was only a minor annoyance.Overall a very good holiday and have already booked for next year. Perfect size for the two of us and what a great location in Honolulu! Easy access to freeways and shopping and just a short distance from experiences such as Diamond Head, Pearl Harbor, Hanauma Bay, the North Shore, and both the Windward & Leeward Coasts, etc. Oh, and the parking is perfect given the traffic and lack of on-street parking in Honolulu. And, if you do not want to drive, most everything is in walkable distance. The view from this condo is spectacular! Just a very enjoyable experience. Can't beat the view and location. Very reasonably priced and the ease of checkin/checkout was fantastic. If you spend a significant amount of time in Waikiki, this is the place to be. Very clean. All the amenities you need...like your own home. Checkin was great. No maid service, so keep it clean yourself. Hubby, our two adult sons and myself stayed here for 7 nights. Plenty of space and we didn't feel squashed. Tons of places within walking distance to eat/drink. Abc store or the Pantry (?) is close by for buying food/snacks/drinks. The Pink Line Trolly takes you down further into the main Waikiki shopping/food area for $2 each a ride. Or you could walk along the beach to get there. Sad that Dec 2013 will be the end of the international market place. Great deals there. The lanai is very tiny! We knew that before going, but it is really tiny. Move the two chairs and table so more then 2 people can enjoy it. Very quiet and clean. Safe area. Die Wohnung war wie auf der Website beschrieben.Toplage, sauber, herrlicher Blick vom leider zu kleinen Balkon.Service/Betreuung durch die Objektverwalter sehr gut.Wir reklamierten einen defekten Toaster. Auf unserer Mail wurde sofort geantwortet, innerhalb von 3 Stunden wurde er ausgetauscht. Our 5 day stay at the Ilikai Marina Condo was fantastic. We arrived after a very long travel but were very excited to see everything as soon as we arrived. We were meeting other family members who were also there for a family wedding. The condo was very well maintained and very clean. Even though we did not do any cooking or very little eating there, it was well equipped with all the amenities. The view was breathtaking and the fireworks from the Hilton Hawaiian Village on Friday evening were fantastic. The location was perfect for anything you wanted to do. There was an aBC store directly across the street and all the shopping you wanted to do was within walking distance. I would recommend this location to anyone who looking for fun and excitement. Thanks again for a wonderful stay. Great condo in a great area. It is well stocked with supplies for both the beach and a temporary home. Very comfortable. The sliding door between the bedroom and the living room is good for privacy - couldn't hear anything at night between the rooms. Close to lagoon and the beginning of Waikiki beach. I would stay again. Very clean as well. The condo is well maintained (maybe it could be refreshed a bit with fresh paint) and had everything we needed for a comfortable stay. It's our 4th stay in this building and we love the location. Condo was very well equipped. You have everything you need for your holiday. Location at the quieter end of the strip. Well located for shopping, restaurants and transport. Easy walk to beach / lagoon. Amazing fireworks every Friday night - see them from your Lani. My family of four stayed comfortably at condo 1286 for one week. Two young kids stayed on the pullout couch with the ability to completely section off the front living room from the bedroom with the large sliding door. The condo stayed cool all week with the air conditioning unit, we were able to make breakfast every morning in the full kitchen and watch nightly sunsets from the tiny lanai (just throw open the sliding door to enhance the size). Parking access was easy in the adjoining structure ($20/night or $7 for 11 hours) or parking along the marina for $1/hr. Plenty of options. There were many restaurant options close by within a 5 min. walk or 15-20 min walk to Waikiki. The Hilton lagoon and ocean area was convenient for those who like to exercise in the morning with a brisk walk or jog or sunbathe in the afternoon. The condo itself is fully stocked with every piece of kitchen equipment that you can imagine, bathroom towels, beach towels, and beach equipment. We inherited several beach items from visitors we met along the way and left them behind for others to enjoy. We thought we might encounter a couple of snafus as the building had a timed water shutoff in the middle of one day and a pest control spray on another, but we were out sightseeing/beach going for much of the week with no problem. Perhaps a better working vacuum to pick up bits of food and sand would have made clean up easier for this neat freak Mom. Overall, a great condo for any type of vacationer! Many thanks for the organization with booking and fantastic instructions. This would be a total 5 Stars except for the size of the small balcony, not what I would call a lanai. Everything else though is excellent including the gorgeous view, price of parking, value, comfort, cleanliness, Great location which is why we chose it to try it in the first place, and service. This is our 2nd time renting from Gillian & Vlad and it will not be our last. I hesitate to give such a glowing review because I'd rather keep the availability of this treasure to myself. . Perfect location with a view!! My wife and I had an opportunity to spend 5 nights there last week.It is in the perfect location with the Lagoon and Waikiki Beach a 5 minute walk away. An abundance of restraunts and shopping are within steps of the condo.Everything about the condo was as advertised and we were glad we made the decision to stay here. Quiet and comfortable.Close to all the main entertainment areas.And what can I say about the view from the Lanai. The pictures attached are actual photo's that I took.We will definately go back and stay here again! Thank you for the kind words. We are glad you enjoyed your stay and look forward to your return visit. The views from the lanai are wonderful! I can't stop smiling! Perfect location! We arrived 5 days before Christmas and stayed for 8 days. We had such a wonderful location and the views everyday were breathtaking! I chose this location for the views and my 2 college age daughters. One swam in the ocean every morning the other went running on the beach every day. You have 2 beaches to choose from Ala Moana (5 min walk) and Waikiki (5 minute walk). We enjoyed the fireworks at the Hilton Hawaiian Village next door on Friday night. Best view is from the Yacht Club, short walk through the middle of the marina. Parking garage was $20.-/day, there was no weekly discount. There is street parking beside the marina, parking meter $1.-/hr. Red Lobster is on the first floor no reservation accepted. Go early or after 8pm as the lines are long. The ABC store is across the street, very well stocked for short term items, ie, milk. We grocery shopped at Safeway in Hawaii Kai and Longs Drugstore. The International Market Place is a fun place to browse/shop. We also went to the Flea Market at Aloha Stadium. Saturday mornings there is a Farmers Market outside Sears at Ala Moana Mall. Great place for local grown food. People are friendly and helpful. We are so glad you all had such a good time. We really appreciate all the great info included in your review. Thank you. My husband and I stayed in Unit 1286 for 5 days in late-October and enjoyed a relaxing, sun-drenched holiday. The condo was very clean, comfortable, attractive, and well appointed. The view from 1286 out over the Pacific Ocean is fantastic! The location of the Ilikai Marina Condos is excellent. We really like this quieter end of Waikiki. Ala Moana Park, with its gorgeous beach and swimming areas, and ala Moana Mall are a short walk away. It also doesn't take too long to walk into the central part of Waikiki, with its many shops and attractions. There is also excellent bus service from the bus stop near the condo. Another treat is the Hilton Hawaiian Village Friday night fireworks show. The condo's lanai provides an excellent view of the display, or one can walk a short distance to the beach in front of the hotel to watch from the water's edge. Thank you so much Vlad and Gillian! Every detail of this fabulous condo was described spot on and was so easy to find and check in. Beautiful views and very clean. A quick walk to Waikiki beach and the lagoon. The ala Moana Mall is only a few blocks away the other direction and has a huge Foodland store on the north end first floor. So if you stay at this condo you are in the heart of it all. If you are in a hurry for breakfast or too lazy to use the fully outfitted kitchen, there's a McDonald's kitty corner from the condo. And the best ice cream on the planet is not far either, Hawaii's very own Lappert's Ice Cream and also great coffee. I went snorkeling at Hanauma Bay and used the snorkle, mask and flippers that were a perfect fit.Don't forget they are always closed on Tuesdays. The price I paid was a terrific price considering the amenities and location. There is so much to do, and never enough time. Do yourself a favor and stay here...at least a week or two as well. I am saving up for another visit and I won't have to worry about where to stay anymore!!! Everything was so perfect, even the fantastically great water pressure in the shower. Good show Vlad and Gillian!!! Wow what a view !!! My wife and I stayed at the condo last august (2012). The easy access to so many facilities - shopping, dinning,the beaches etc. - was one of the great things about the accommodation. We would definately stay there again. It is a wonderful view! We are so glad you enjoyed you stay. Come back again soon. Communication with the owner was great - no surprises about anything, including costs, directions, getting into the condo, local contacts if needed, etc. Hubby and I just retired, but we are active, and you can literally walk to most everything, and most of the tour companies will pick you up at adjacent hotels. The view is wonderful (harbor, ocean, Hilton's Friday fireworks and lagoon, Waikiki beach, surfers, distant cruise ships, sunsets). Shopping is within a few minutes walk, and 2 local and 2 major chain restaurants are literally in your building. At far end of the crazy part of Waikiki, you can join the party, but sleep in quiet. Ala Moana shopping center (10 min. walk) has every shop you can think of, and Sam's and Walmart are near there as well. We found costs to be about the same as our shops in Dallas, TX - including food. Walk to the grocery store, load up and taxi back. Walk down past Ft. DeRussy (stop at he excellent army museum there) and get into the glitter stores - Gucci, Prada, Coach, etc. Kitchen has Everythinng you need for meal prep, but I took must-have spices for my TexMex addiction. Tv is HD and ch. 24 has the TV guide as well as good Hawaiin music for backgroud when you're chillin'. Recommended: go early in your stay for an Island tour (we used Gray line), find what you want to go back to, then rent a car for a short time (rental companies on the corner by you); Makani Catamaran for a nice on-the-water experience; Hole-in-the-wall food tour is a must - you'll thank me! Note: Go two hotels over to the Illikai Hotel and get your car rental from the lobby concierge there (Sanitago, if possible). It'll save you money. They will ask you to do a time share thing, but just say 'no' if you're not interested. I only caution you that this is not a luxury condo, but still very nice, and for just me and my husband it was spacious. For more people than that it might be tight. I was very pleased with whole experience! We are so glad you had such a great time and we look forward to you returning soon again! Great place, clean, quiet and close to everything! I liked the location the best. Also the bus system. And don't overlook the restaurant just around the corner close to the marina. It's downstairs, and have the greatest breakfasts. Great condo that provides excellent value. This is the second time that we have stayed at this condo. The upgrades are really good and the condo was very comfortable. The only problem was that there was no large pot for cooking, e.g. spaghetti, etc. We bought a stainless steel pot and left it for the next guests. We also bought 2 new pillows as the others were pretty worn and left them. We also left for the next guest 2 snorkels and masks. The housekeepers were very nice and did a good job. It would be helpful to have some decent steak knives, the ones there are pretty poor quality, but other than that, all was good. We are so glad you enjoyed your stay and our renovations! Thank you for the stainless steel pot, pillows, snorkels and masks. We really appreciate your additions. We are staying in the condo ourselves now, doing paint touch ups, adding art work etc. We have bought new steak knives! Great deal for your money. Our unit was clean, easy to get into, very safe.Washer and dryers on 8th - very clean - all in working order. We could walk everywere, security people helpful and friendly. Parking was a breeze, always found a spot.We feel it was quieter than staying "Where the action really is". Have nothing negative to say. Only minor concern was kitchen countertop appeared to have been previously water damaged, but no big deal as far as we were concerned - we just had to be careful to keep it dry. Would go back again. Fireworks great to watch from our little lanai. Close proximity to "ABC Stores" made getting our coffee and breakfast items very easy. View overlooking the marina and ocean a real plus. The unit was nice and clean. It met our needs for 3 adults (my husband, my mother and me). Note on the cupboard said there were snorkels, but none were there. The view was great and the fireworks were an extra treat. The location was not overly convenient to the things we wanted to do, I was glad we had a car even though parking it cost us an extra $100 for the 5 days. Waikiki beach is close enough, but very crowded. 1286 is a great base to enjoy what Hawaii has to offer, the condo is appointed with nice furnishings, very clean , the kitchen is well appointed with all the that you need to cook, but ths location has many resturants with in five mintues walk , so there is no need to cook. Three resturants are directly connected to the condo , we ate at all of them and all were resonable priced and had outstanding service. The lagoon to the left of the condo is wonderful for familys , and beach in front of it is also a great place for a swim , being directly opersite the marina was nice and was not noisey at night. communcation from the owners was fantastic and we would stay there again in a heart beat. Be sure if you arrive by shuttle that they drop you off at the Ilakai Marina and not the hotel. We were able to open the door in 2 trys. Don't be shocked like we were when you look at the kitchen floor. It looks like it's dirty but it's not. Just alot of wear and tear. It really should be replaced. Everything that we needed during our stay was provided. Thank you for the salt & pepper, spices, coffee, sugar, and all the etc. It made shopping alot easier, and what a nice suprise to find the shopping cart. It really came in handy. Everything was fresh and clean. The flat screen tv is a plus. It was easy to do laundry no one else was there. There is a little noise from the street if the door is open during the night. We just left it closed until around 1 or 2 in the morning and was fine. It is alot quieter during the weekdays. The fireworks were great. I've never been that close. This is a very safe place. We saw the guard everytime we went in and out. The view is to die for. We watched our cruise ship come in the morning before we left. A cooler, beach towels and chairs were available. We would stay here agian only longer due to the cleaning fee. You just missed being the first guests to enjoy our new ceramic tile flooring through out the condo, so no longer do we have a worn kitchen floor! My husband & 2 teenage children stayed in this condo for 6 days. It was more than sufficient for our needs. It was very clean & well-maintained. We would definitely stay there again. the purpose of our trip to Oahu was a long over due vacation, and vacation it was thanks to the comfort of this condo. We did not rent a car as the bus service was so accessible and we were able to walk most places. A highlight of our stay in the condo was the great view of the fireworks in the lagoon Friday nights. We look forward to our next visit to Oahu and will definitely hope the condo is available! There was a small problem with the plumbing, but it was taken care of quickly and with great care/consideration for our plans. We were well taken care of. The condo was clean and neat and had a great view of the marina. The location couldn't have been better! It was walking distance from anything we needed. I couldn't have picked a better place to stay. As my stay was brief, because I relocated to the Hawaii Price right next store. There was no night security lock on the door, there is a dead bolt that is keyed from the outside, no other security style locks. The first night there were escapes convicts on the island that had not been caught. The first night there were people outside my door attempting to get into the condo mistakingly thinking this was there condo. There was only a bolt that intended as a lock for the sliding door. I called the name that was listed in the manual that was inside the condo, twice with no response (actually it was hand written into the manual), I was later informed when emailing the owner that there was a name of a person called Kat that was on my initial paperwork (this was not the ER contact in the manual that stays in the condo). There was no attempt to make any of this right, just the standard cut and paste of "here is our policy", as I incurred all of the charges for the safer location for the remainder of my stay. The appearrance of the condo was not as much of a concern as the security risk, it is still on the "aged" worn side, the carpet is stained in areas, the pillows on the chairs in the dining area are stained, the floor in the kitchen is cut up in areas. everything else is standard (bed with big flowered average spread, couch that is average, tv's and basic appliances, and several items for an extended stay-beach items and such)If you would feel safe with just a regular lock, only use this as a place to sleep and you were going to pay the reduced rate that I found (99/night), then this condo would be a consideration. My reguirements for a business stay are not excessive, this condo did not reach even the basic need of safety for a stay by myself. We are sorry you had such a bad experience in our condo. What a terrible way to spend a night, imagining these escaped convicts, all heading for the Ilikai Marina! However, the security and comfort of our guests is our primary concern. We had never had any previous complaints about our locks. Since your visit we have installed a modern keyless locking system and have done away with lockbox. We have also installed an additional bolt lock on the inside. The keyless locking system was planned, but the extra inside security bolt is in your honor! The security at the Ilikai Marina is well maintained and on June 26, the day of your arrival, a security guard was on duty. In the Welcome Manual we give the number of the security office, and the call is forwarded to the cell phone of the guard on duty in case he is on his rounds. If you had called the number of security in the welcome book, they would have been able re-assure you as well as check the security video screens. The resident manager’s number is also in the Welcome Book. We had recently changed our local contact and we apologize for not having updated the information in the Welcome Book. However we did give you the name and number of our new local assistant in our correspondence. It is now also on the condo door. We bought the condo 18 months ago. At that time we bought a top of the line king-size Simmons Beautyrest bed and mattress, so it would be considered above average. We bought the queen-size sofa bed at The HomeWorld, the nicest furniture store in Honolulu, along with dining room table, chairs etc. Several of our guests mentioned in the posted reviews how comfortable the bed was and how beautifully furnished the condo was. We stayed in the condo 3 weeks prior to your visit and unfortunately we did not notice any stains on the dining room chairs, as we certainly would have done something about it. The appliances are all new and were installed when we bought the condo. The photos and the video on the alohacondos.com site speak for themselves, however, since taken last year, we have added beautiful artwork in the living room and the bedroom and a flat screen TV in the bedroom. We did not replace the carpet or the kitchen flooring yet, but have always planned to replace the existing flooring in the entire condo with porcelain tile this year in the fall, which is being implemented. It is a pity you waited 10 days to contact us about your unfortunate experience. You did have our e-mail and telephone number. We had a great stay in condo 1286. Check in was easy. We didn't rent a car so I don't know about parking. But I do recommend a city bus pass. The condo itself is quiet, there is evening and weekend security for the building. The kitchen floor is very slippery with socks on, so be careful making the corner there! The shower door was a little soap scummy, but otherwise the condo was very clean. I travelled with my 16 month old, I wasn't too crazy about the electrical cords (lamp cord, and an extension cord) They are big temptations for a child. There are lots of pots and pans and other utensils but they are well used. All in all I would stay in condo 1286 again. And I would recommed it. We really lucked out when we found this condo available for our travel dates. The communication between us and the owners were excellent. When travelling with kids it can be stressfull if you are jammed into a small space but that was not the case with condo 1286. We had plenty of room for us and our two children. The pull out Queen bed was more than enough for them and the privacy sliding door was useful when we wanted to stay up later. The view is incredible! We got there on a Friday so we saw the Friday night fireworks that the Hilton puts on right from our room/lani. Kids loved it! The condo was stocked with everything we needed for the beach along with a cooler which came in handy everyday!There is a laundry service available on the 8th floor which was easy to use and handy to have available espcially when you are swimming in salt water all day everyday. The location was ok, a little far from the main Waikiki strip but there is a bus that you can catch out front and if you don't mind walking then you can get there in about 20 mins along the beach walkway. As for groceries, you would be best going to the Foodland at the ala Moana shopping centre and taking a taxi back if you don't have car. It will only cost you about 7 dollars. You can walk to the mall it's only a 5 mins walk and well worth it!I could go on and on but I won't, If you are looking at renting 1286 I would tell you do it you won't regret it. We are already looking at going back very soon!Thanks Valdimir and Gillian! A view to die for. Very comfortable and quiet.We will be returning very soon. A spacious apartment located a short walk to ala Moana shopping centre or Waikiki. Bus and restaurants close by. Views from the Hilton hotel lagoon, across the alawai Marina to Magic Island. Bring your binoculars. You can leave the sliding door open on cool nights, the street below has little traffic to keep you awake.The big bed is comfortable, balcony small, but who cares?Older style kitchen with modern appliances,loads of fridge space. 1286 suited us, we would stay there again. I love the ocean and yachts. 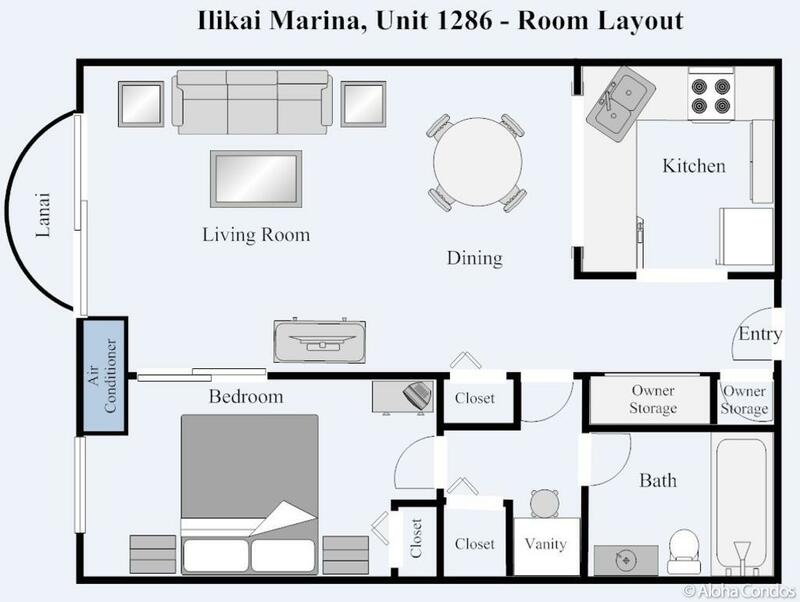 The room 1286 was just the right one with beatiful landscape of yacht harbor and sunset.Ilikai Marina Cond is located just around the corner of world famous shopping center, Ala Moana Shopping Center and the transportation is very convinient. The guide to the Ilikai Marina and the room was perfect and I had no trouble to get into the room from Honolulu Int. Airport. The room was clean and equipped with all the kitchen goods, even rice steamer. Internet cable was available with charge free, although american Hotels often impose the charge.Moreover, I could feel the warm heart of the owner who helped the communication. I recommend this room for everyone to visit Waikiki. This is a very nice condo with ocean view. It had all necessary kitchen equipments. Condo is in prime location closer to mall and resturants. We really enjoyed staying there. Cons: Expensive to park car. The condo was great. Thank you very much! We had a wonderful time as usual. We go every year like clockwork. We might as well own a property there but this condo gave us the home we needed and more. It was very close to shopping and beaches. It has a wonderful view of the fireworks on Fridays that Hilton Hawaiian Village puts out every week. It provided a haven for my tires children after a full day at the beach. Parking is quite expensive but otherwise, this condo has all the amenities of home except you are in paradise. We are so pleased you had such a good time. Thank you for taking the trouble and writing such a nice review. We very much enjoyed staying at this condo. The views are wonderful, and the condo was very clean, comfortable, and conveniently located. Many household appliances and sundries are provided for your convenience. We highly recommend to anyone looking for great value for money in Waikiki and don't require amenities of a hotel such as a concierge or pool. Condo 1286 is conveniently located to shopping, beach and public transport. Our previous stays in Waikiki have been in expensive, tiny hotel rooms. Staying in full sized apartment made our holiday so much more enjoyable and economical. The thorough description and photos on aloha Condos site are accurate, and dealings with the owners were prompt and helpful (eg being allowed to leave luggage early in morning in condo before afternoon check-in). This was our fourth time renting a condo at the Ilikai Marina. We never stayed at unit 1286 before. Being on a higher floor and farther away from the elevators, the unit was nice and quiet. The unit has basic amenities, fully-stocked kitchen, good air conditioning and comfortable bed. The bathroom faucet could use upgrading, it was rather dingy. Beach chairs would have been a nice touch--we had those available in previous units as well as other little amenities like boogie boards, etc. Owners were friendly and provided quick responses to emails. WiFi was available by piggy-backing off available signals within the building so it was hit & miss. For the price, it was a good value. The condo was everything I hoped it to be. It was very nice. I loved the private bedroom that could be completely closed off from the rest of the condo. I was pleased at all the little surprises like beach towels,beach chairs and a cooler. They thought of everything. We even found a filtering water picture in the fridge. Just across the street was a McDonalds and a little store called ABC were you can buy everything from souvenirs to groceries. The building has several nice restaurants, however we cooked most of our meals in the fully stocked kitchen. Best value for the buck. We will be back again. Nice condo, tastefully decorated, well cared for and well equipped. Owners obviously take pride in their place and are very nice to deal with. Convenient and very versatile floor plan. Quite central. Interesting, ever changing view. Walk to beach. Easy to access by car. Cars are reasonably priced to rent but parking is expensive in Waikiki. Guess it all evens out. Red Lobster, Outback Steakhouse and Charthouse on bottom floor of the building and shopping on the next block. Only criticisms are some street noise but (not unexpected in the middle of the city) and small balcony but oceanfront location makes up for that. well taken care of by the Renter. All details covered! The service and assistance received from the renter were outstanding and above most expectations.The condo was as good as it appears on the web site.The location is great if only 2 blocks from a beach is what you are looking for.Loved the close proximity to the Ala Moana Mall.Great view of the Marina/ocean.Was a treat to have the option to cook my own meals.Best water pressure you will ever experience in a shower.Choose this Renter for a well taken care of vacation. We are first-timers to Hawaii-still there as I write this- and were fortunate that Vlad and Gillian had three days available. Their condo deserves all the praise that it has received It was beautifully equipped with a full kitchen and was immaculate. The bed was large and very comfortable. Having a local phone saved us many extra cell phone minutes. The lanai is small, but fits two, and we used it often.. It overlooks the marina and the ocean. From the building it is a short walk to the beaches in front of the neighboring Hilton and to Waikiki, in one direction. There was good shopping close by. (At the Ala Moana Market Place, we enjoyed Mauana Loa Poi Bowl in the food court. Be sure to season the poi with the Lomi Lomi Salmon. The Island Vantage coffee stand in the court made one of the best espressos I've ever had. Our only problem was with WiFi, because I brought our old, less sensitive, laptop with us. Although there were accessible networks all around, I got the best, though still variable, reception by paying for the Metro18 network. We highly recommend this unit and hope to stay in it again. This would have been great at twice the price. Stayed here after an earlier stay in similar condo in Illikai Marina complex. We knew the ropes--parking, elevators, 11 a.m. checkout, etc. While lanai is miniscule, view of marina and beyond is great. We had all we needed in condo, which was convenient to walking Waikiki and driving out of town. We had stayed at another unit in the Ilikai Marina previously so we knew we'd like the location and view. 1286 was very nicely furnished and, as we knew from prior visits, has a view we love. Vilad and Gillian were wonderful to deal with and provided complete information so our arrangements before and throughout our stay were very smooth. This was our first trip to Hawaii and Gillian and Vlad made sure it was perfect. The condo is even better than the photos show and was spotless, cool and welcoming when we arrived. Nice extra touches included ice in the freezer, filtered water in the fridge and a guidebook to help with things to do. There were also coffee filters and a generous assortment of spices for cooking. Truly fully equipped. The view was spectacular, the bed extremely comfy. Linens and towels were plentiful and of high quality. It is only a short stroll to the Hilton Lagoon and beach. There is an ABC store steps away and plenty of restaurants within walking distance. The only negative was the poor attitude of the attendants working in the parking garage. We will definitely stay here again and would recommend this condo highly to anyone else wanting a quiet, beautiful, perfect stay. Gillian and Vlad are awesome hosts. A special thanks also to Mary for making sure everything was so clean and tidy.